Size of Male: 60-70 lbs., 21-22 in. Size of Female: 50-60 lbs., 21-22 in. Color: White or Colored with Head markings. Colors include Black, Brindle, Fawn, Tri-color and Black-brindle. Best known for their egg-shaped head and the ability to mumble by themselves, the Bull Terrier is a pack of mischief and energy that highly active households would love. The dogs are quite muscular and are fond of knocking you down and kissing your face the moment you come home. If you’re searching for a pet that can wow you with a spectacle of affection and jealousy, the Bull Terrier may be the right dog for you. The history of the breed is one from rags to riches. For a time, this dog breed was associated with the lowly pet owners since the they were originally bred for dog fights. In 1860, cross breeding of the original fighting dog with a White English terrier produced such lovely results that the upper classes began to take notice of the dogs in the show ring. Not long after, they became fashion staples. Both white and colored varieties have made their mark in today’s films and commercials. 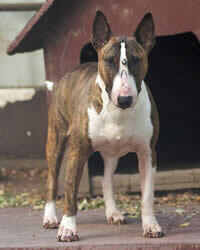 “Bullseye” is a miniature Bull Terrier feature in TV commercials for Target stores. Another example is Spuds MacKenzie a well-known dog used for advertising Bud Light beer. The clownish look of this dog breed speaks well of their mischievous and entertaining disposition. You will find them affectionate at home. However, they become aggressive against other dogs and especially among smaller animals. They are particularly greedy of their grub and of your constant attention. They will resort to destructive chewing just to catch your notice. Living Environment – Access to a fenced yard is optimal for this playful dog breed, but that doesn’t mean it’s okay to let them live outdoors. The dog’s need for human companionship makes them better adjusted for a domesticated lifestyle. If you dwell in an apartment, you must be committed to make up for the absence of space with plenty of exercise to stimulate your pooch. A cluttered environment is an inviting haven for a bored dog to wreak havoc. Grooming – In the grooming department, you’ll find the pooches to be undemanding. They do shed heavily but require minimal coat care. An occasional brushing will suffice. Some owners just pluck the dead hairs by hand! Needless to say, a vacuum cleaner is your next best friend to the pooch. Diet & Exercise – Due to their bond with you, this terrier breed will eat practically anything you feed them. Most owners agree, however, that a combination of raw diet, commercial food and fruits work best for the breed. Be mindful of any allergic reactions that your pet might exhibit. One of the triggers of destructive behavior with this dog breed is inadequate exercise. Short walks aren’t enough. On the average, you should schedule two long walks each day. For an extra treat, surprise your pooch with mental and physical challenges every now and then. Health – Deafness is often associated with the white variety, but topping the list of serious health issues are kidney, eye and heart concerns. In addition, they are prone to developing allergies and will likely contract them after an outdoor adventure. Fleas, mosquitoes and insect bites are the most common culprits. Even though they are eager to please, most Bull Terriers end up sporting bossy and obstinate behavior during dog training. The dog will continue to challenge your right as the pack leader. It’s best to start early and lavish the breed with enough opportunities for socialization and play. Under the right tutelage, this willful Terrier can be quite a darling in obedience routines.